When designing the ten municipal halls scattered across the Netherlands, the traditionalist Kropholler sought the 'perennial values of the Dutch building art' and a 'craftsmanly processing and application of local materials'. 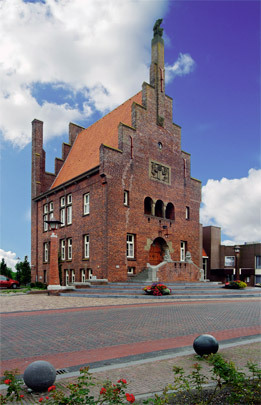 The traditional means he used for one of the best known, in Medemblik, are its raised position on the axis of Nieuwstraat, the use of brick, the stepped gables and dormer windows, the heavy timber door with its wrought ironwork, allegorical sculpture and the centrally placed municipal coat of arms. Yet the detailing, most notably the well-nigh Romanesque restraint of the interior, betrays Kropholler's admiration for Berlage.